The AUA LL.M. Program is proud to announce the publication of its own faculty member and lawyer at the European Court of Human Rights Arman Zrvandyan’s (LL.M. 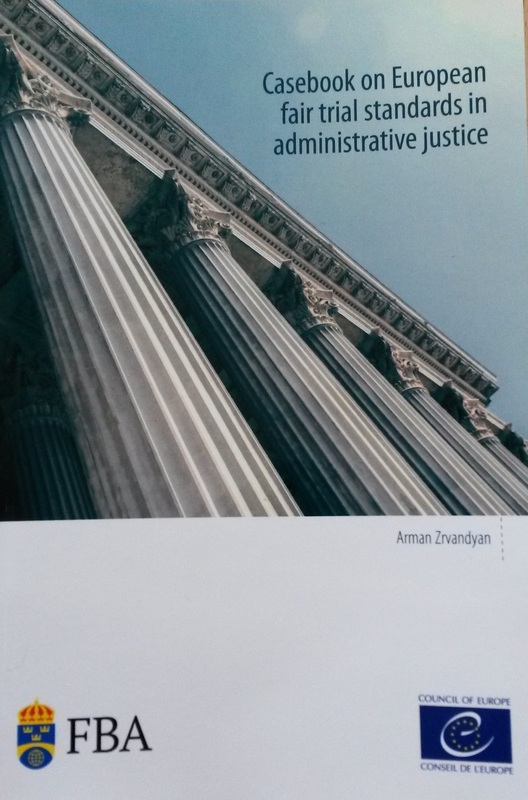 2007) book, which is titled “Casebook on European Fair Trial Standards in Administrative Justice.” Mr. Zrvandyan has been working on the casebook for the last several years. The casebook covers the most important ECHR decisions, elaborating on issues related to administrative justice and fair trial. Interest in administrative justice and the judicial review of the administrative acts has been growing in many countries recently, including many Council of Europe member states. At the core of an accountable and transparent administration is the right to effectively challenge acts and decision that affect civil rights and obligations, and the daily life of individuals. Effective means of redress against administrative decisions require a functioning system of administrative justice that provides fair trial guarantees. An administrative process should be public, held within a reasonable time, undertaken by an independent and impartial tribunal established by law and result in an enforceable judgment that is pronounced publicly. This casebook, the first of its kind, provides a systematic and accessible overview of what administrative justice means for Council of Europe member states. The case law of the European Court of Human Rights on the right to a fair trial is described and analyzed as it relates to administrative proceedings.